any plans for next year. 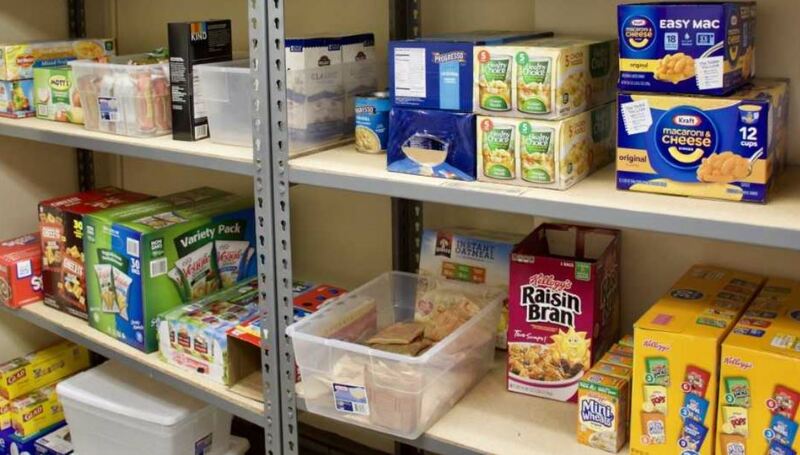 Lesley Public Post: How successful would you say was the food pantry this year? students come in as we got the word out about the food pantry. We see a lot of people who come time after time and have nice things to say, like that they really appreciate this or that this is all the food they are going to eat today. So it’s nice to know that we are making a difference to some people, and that maybe their day is made better because the food pantry is here. LPP: What are some struggles that the pantry has faced; is there anything you may still be facing now? Linda: Sometimes it’s just hard to keep enough food in stock. We take big trips to BJ’s and then a few days later it looks like the pantry is empty again which is great because it shows that we are filling such a need. So sometimes it is hard to keep the shelves stocked. I wish we could get more donations; but we rely on the campus to bring donations and they’re all commuters. When you think about it, all faculty and staff are commuting to campus. So putting something else on your car or in the bag while you’re in the train is hard for our staff and faculty as well. Recently we have partnered with food for free who brings us sandwiches each week and fruit; we have been able to get more items to feed more students which is good. LPP: What are your plans for next year? Are you planning to change anything? Linda: So, we are going to keep the same general model for next year. We are going to try to find a better way of tracking the food that comes in, the food that is donated, and the food that is purchased, just because it is good to know what we start off each week or each month with. Commuter students should probably get a survey letter this month asking them for their opinions and what could be changed, what do the like or dislike, and I will also be meeting with all the student workers next week to see if they have opinions since they sit here for 2-3-4 hours at a time and they have probably heard comments from people that they can share and have ideas of how to make things run more smoothly. So, I don’t know what the changes are going to be. We also need to figure out what the summer is going to look like because there are summer students at Lesley who can probably benefit from the food pantry. But are there enough students who are able to work in the summer? What sort of schedule will they be working on? LPP: So you are considering keeping it open this summer? Linda: I think so! Just because I don’t want people to not have food when they need it. It is nice that we can help students out and even if it is just in a day we are open 2 or 3 hours a day instead of the 8 -10 hours that we are open now, people could come in and grab something for now and something for later and hopefully that can get them through the day. LPP: I noticed there are many sandwiches in the fridge with the sticker “Charlie’s” on them. Are they from the school’s cafeteria? Linda: No, it is just coincidence that it is the same name. So we get these new sandwiches from a place called Food for Free – and they rescue food from restaurants and grocery stores, [food] that might go to waste. So if you ever go to the grocery store and you see pre-made sandwiches, you will see that they make some on Monday and then they make more on Wednesday. If they still have sandwiches from Monday, no one is going to buy them because they’re older and people want the fresh sandwiches. So this company rescues these sandwiches and redistributes them. The sandwiches we have might be a day old, but you probably eat older sandwiches all the time at your house. So, that’s why they come pre-wrapped and they have labels on them that say they came from restaurants (in this case Charlie’s). Like last week, we got a bunch of stuff from the grocery store Be Fresh and sometimes we get [items] from Starbucks, Trader Joe’s and other places. LPP: Did you consider buying vegan and gluten free snacks? Or do you only get them by request? Linda: We received requests for vegan and gluten free food since the beginning of the semester, because a lot of our students actually are gluten free or vegan. So we actually found a website that sells vegan and gluten free food for a discount. We just buy it online and ship it here. We order from them every three weeks or so, and sometimes we buy when we go to BJ’s – every two works -sometimes every week- depending on how things are going in the pantry. contact Linda Elliott directly. She’d be happy to hear from you.